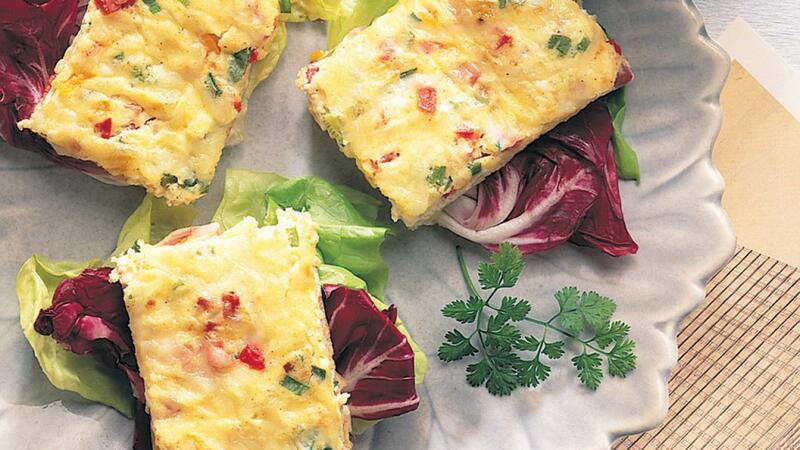 This country quiche is a quick and easy recipe for brunch or dinner. Ham, vegetables, green onions, and cheese are mixed with a creamy egg custard and baked on top of a bread crumb base. Spray 15 x 10-inch (40 x 25 cm) jelly-roll pan with cooking spray. Sprinkle bread crumbs over bottom of pan. Scatter ham, vegetables, green onions and cheese in pan. Whisk eggs, milk and cayenne pepper just until blended. Pour over ingredients in pan. Bake in preheated 350°F (180°C) oven until egg mixture is just set, about 25 minutes. Do not overbake. Let stand 5 minutes. Cut into rectangles and serve hot, warm or at room temperature. For lunch bag, wrap serving of quiche in plastic wrap; it may be reheated in the microwave oven until just warm.